Contemporary floor decor ideas from Germany are inspired by the beauty of traditional patchwork fabric patterns and elegance of antique oriental rugs. 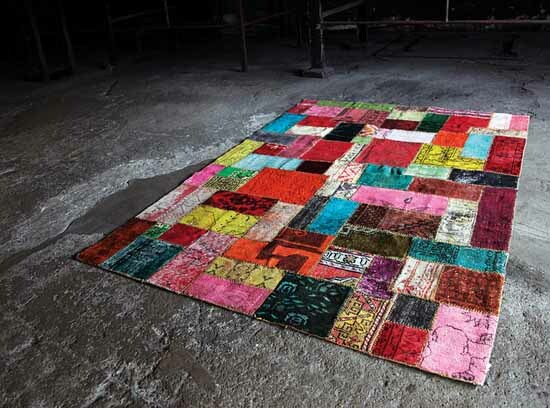 Contemporary rugs from the unique collection, called Industrial, made of antique wool rugs in patchwork design style, celebrating traditional crafts and timeless charm of antique oriental rugs, made in Turkey. Unique contemporary rugs from German designers, miinu.de/ continue the Industrial collection that was presented last year. Colorful and monochromatic contemporary rugs, made with pieces of antique wool rugs create beautiful and luxurious modern floor decor, demonstrating the quality of Turkish wool rugs and impressive color design of traditional ethnic products. Small rectangular and square pieces in similar or different colors are carefully collected to create timeless patchwork fabric design. (Modern interior design trends, inspired by patchwork fabric) Each of wool rugs are at least 50 years old, ad were found in Anatolian villages in Turkey, the region famous for creating exclusive wool rugs. Contemporary rugs bring beautiful colors and high quality of antique oriental rugs into modern homes, blending contemporary design with old crafts, traditions and patterns, and creating striking floor decor. Contemporary rugs, tastefully made of small pieces of oriental rugs bring unique character and dramatic accents into interior decorating. Charming and colorful, or elegant and calming contemporary rugs become a focal point of modern room decorating. Most contemporary area rugs are made of similar color pieces,creating elegant analogous color palette. Colorful contemporary area rugs celebrate rainbow colors, adding drama to modern floor decor with eye catching room decorating accessories that feel soft and luxurious. Blazing Orange, Green Flash and Hot Pink create chic floor decor, blending western interior decorating ideas with exotic bright colors of local products and high quality of antique wool rugs from Turkey.